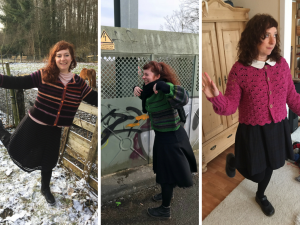 In this third part of my presentation (and hopefully explanation) of various methods to knit or crochet a cardigan we reached my favourite technique: working top-down. You may ask why I love this method so much and I could tell you it’s due to me being lazy and impatient but most likely it is due to me being absolute genius and therefore loving the fastest, effortless, and best of all methods. Remember the advantages of top-down constructions? No? No problem I will gladly repeat them: While working from the neckline to the hem in one piece, you can try the cardigan on. There will be no surprise at the end. 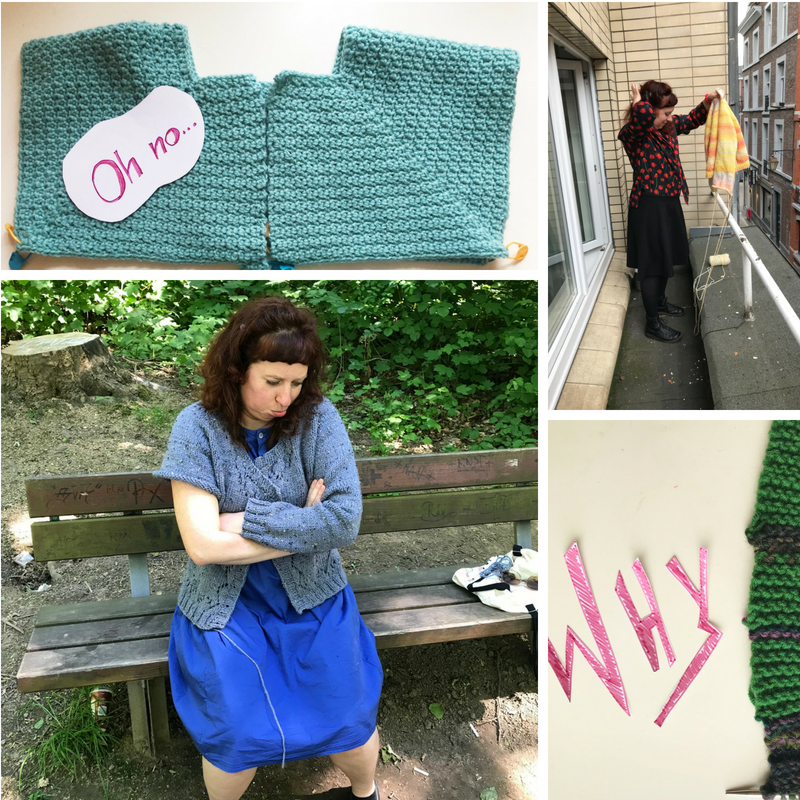 You can alter the fit on the go, for example elongate or shorten the yoke, make the sleeves wider or narrower, decide to use a more tailored or a boxier style and so on. The second pro is, less sewing. I know, there may be people who love to sew, but I am not one of them. With the top down construction, it is possible to work the whole cardigan completely without sewing (but I must admit, I normally crochet/knit the sleeves flat, because I do not like the fit of the slightly spirally texture, if knitted/crocheted in the round). 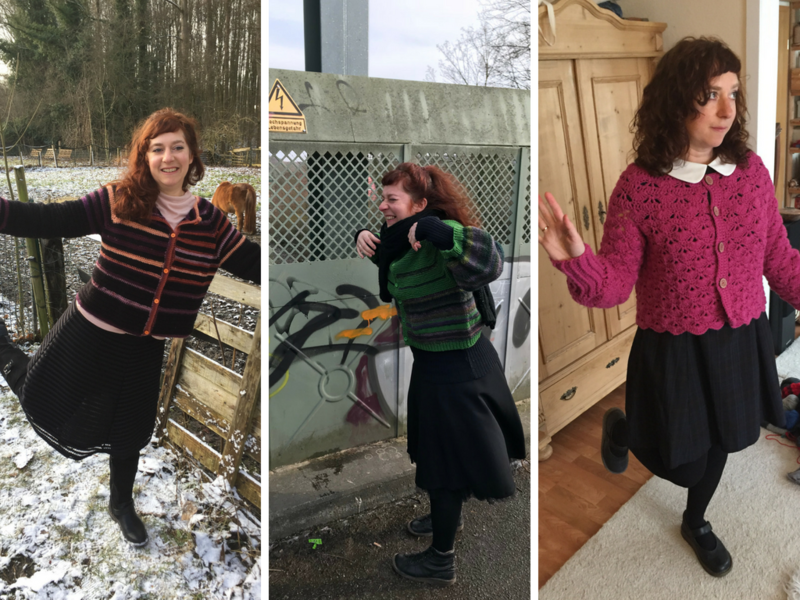 There are for distinctly different methods to work a cardigan from the top down: the yoked cardigan, the raglan cardigan, and the cardigan with set-in sleeves (perhaps there are more methods, but these are the best known). 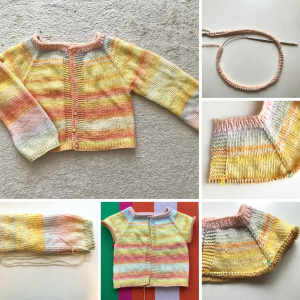 All these methods work in crochet and knitting. 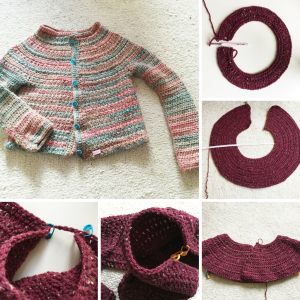 On the photos you can see how a round yoke is crocheted… sadly I had to unravel the red yoke, because the wool was discontinued. The shown finished cardigan has also a round yoke but with an easy lace pattern. This construction is very similar to the yoked cardigan, only the increases align above each other at the four ‘corners’ of the cardigan. Again, you start at the neckline, but this time you must set four markers which separate the fronts, the sleeves, and the back. The increases are always directly before and after the markers. In knitting you increase 8 stitches every second row (while knitting in stockinette) and in crochet 8 stitches every row. In this way a rectangle is formed instead of a circle. The rest is the same procedure as the round yoke cardigan. This is my favourite construction, because you always know where to increase and how long. And I prefer the rectangle form of this cardigan. 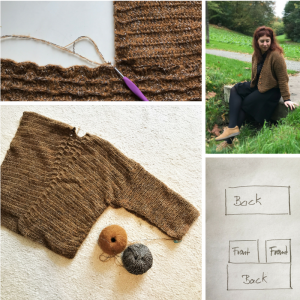 The round yoke can lead to an uneven form in a cardigan, where the two fronts fall open while wearing the cardigan. Because of the round yoke the middle of the cardigan seems to be longer than the sides. On the photo you can see the set-in sleeve construction in crochet. The pattern is Esme cardigan from Vicarno. Naturally there are many more top-down constructions and you can combine methods. Nevertheless, I hope I could give you a rough guide how these top-down garments are worked. The next part of this post will look at one of these methods in depths.